CASS Shapewear Lucky Back is an everyday solution to support and improve posture by gently pulling shoulders back throughout the day. LUCKY BACK by CASS seamlessly engineered with nylon /spandex blend is an everyday solution to support and improve posture by gently pulling shoulders back throughout the day. 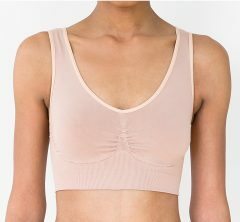 LUCKY BACK by CASS seamlessly engineered with nylon /spandex blend is an everyday solution to support and improve posture by gently pulling shoulders back throughout the day. Lucky Back reduces the tendency to slouch over computers, iPhone, patients, etc… An amazing layering accessory to extend the wear of your sleeveless tops and slim arms. Wear often for best results! All measurements are designed to be used as a guideline.